Nadia Taha is a producer at Sudan Radio Service, or SRS, based in Nairobi, Kenya. We met in March to talk about her childhood in Darfur, activism at university in Khartoum, and work as the first female reporter with SRS. This Q&A is excerpted from our conversation. Can you talk about your experience growing up in Darfur at the height of the conflict? Can you explain a bit more – what had happened to the villages? The SLA – the Sudan Liberation Army – had attacked government army positions in Tina, and then all the armies [rebels and government soldiers] came to Tina. All the people crossed over to the other side of the border, in Chad, all the civilians. For us, the students, we just left and traveled back to El Fasher, and it was ok for us, because at that time all that area was controlled by the rebels. Who had burned all the villages? It was the Janjaweed. They were retaliating for the attacks by the SLA, but at that time we didn’t know. We were just traveling through the villages and finding them not there. It was a dangerous time, taking that road. We met many times the rebels, and they would ask where we were going, and we told them we are students. Before we came to El Fasher, like 50 km from the city, we came to a village that had just been attacked. The people were crying, some people were injured. And we asked them, “Who did this?” And they said it was the government’s military. So when you were back in El Fasher you took the exam to finish high school? Yes, and I passed. Then I was going to Khartoum for university. My mother had died this same year; she had been sick. So in 2004 I traveled to Nyala with my grandmum and my aunties to sell my mother’s cows so that I could go to school. They sold most of them, and then they gave me the money so I could go to Khartoum to study. Had you ever been to Khartoum before? Never. I was very excited. I had heard so much about Khartoum, so when I was going there I was so happy. You know, after that incident in Tina I had much hatred for the government in Khartoum, the NCP. So when I got to university I joined a Darfuri political activist group, and I was very active. I joined the SLA of Minni Minawi, the student group that was supporting the rebel group on campus. We used to argue with the students of the NCP. What kind of activities did those student groups do? If there was any violence in Darfur we would do a demonstration. We did many demonstrations. During my first demonstration in 2004 it was really difficult. We went to give a letter to the U.N. saying there is genocide in Darfur. And there was a big reaction. They came to our hostel [dorm] at the university and bombed it. Most of the Darfuri students were staying together in the same place, so we all had to run. It was a very big incident. No one died, but there were many injured. Were there many women involved in the Darfuri student movement? No, not many. We were very few Darfuri girls at the university. Where do you feel like your political activism comes from? Are your parents political? No, all my brothers are very quiet, they are doing their school. None of them are involved in politics, only me. When I was coming from Tina I could see that the government doesn’t want the civilians of that area to live, so they bomb and kill the people of certain ethnicities. My father used to tell me not to get involved; he would say, ‘They will kill you.’ But I didn’t listen to him. I guess it was particularly risky for you as a woman, because you stood out among the male activists at school. Yes, that’s true. Some of the other students used to call me Condoleeza Rice! How did you decide to study law? My mom wanted me to do it. To come to Khartoum to study law is very difficult for Darfuris. You have to have high marks. But some people succeed. I did my training with a lawyer in Khartoum, but when I was finished in 2010 I didn’t find a job. But that’s when I got recruited to work for Sudan Radio Service. They were looking for women who could speak Arabic, some English, and Zaghawa language, and a family friend knew about the job and nominated me. So that’s when you moved to Nairobi, to do this job? Yes, I came to Kenya immediately. Do you ever go back to Sudan? No, I can’t. The Sudanese government thinks of Sudan Radio Service as “rebel radio,” because we bring the news to Sudan, especially about the conflict areas, like Blue Nile, Nuba Mountains, and Darfur. We talk to the citizens there, and to the rebels as well, so it would be dangerous to go back. Today we’re also covering East Sudan as well. You were the first female radio producer for Sudan Radio Service? Yes, when I came to Sudan Radio Service there were no other women – just six guys. I started presenting in my local language, Zagawa, and in Arabic. And finally I came up with the idea to do a program about women’s issues. The project agreed, so I started this program, focused on violence against women, women’s education, human rights. It airs on Fridays and Tuesdays in Zagawa and Arabic. 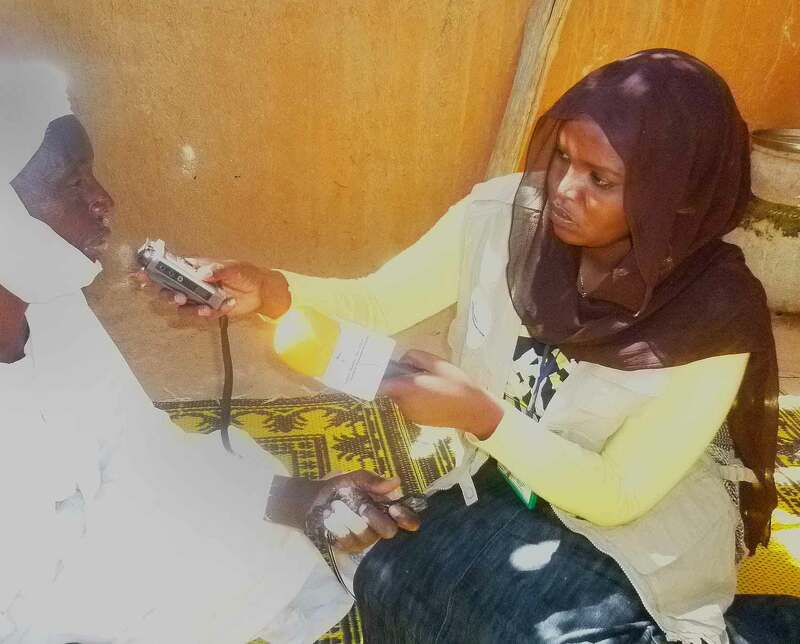 Are there many radio stations that reach Darfur? Yes, there are many, but the way we cover the news is different, because we believe in balance. Some radio stations only cover the rebel side. But at Sudan Radio Service, if the rebels say that they attacked a government position and killed a certain number of soldiers, we have to ask the government for its view. We put the two voices in the stories together. The listeners decide who is saying the truth. Do you primarily cover Darfur, or do you cover other areas as well? I cover Darfur daily. Other reporters focus on the other conflicts. I report daily on North and South Darfur in Zagawa. I even went to Chad once, to visit the Darfuri refugee camps in the East. In some of the camps I was focused on women’s stories. That must have been very interesting to speak to people from your home area but who had been displaced for a long time. People were very happy that I came, because they listen to me on the radio and they know my voice, and I speak their language. I was there for Eid, and you know that for the holiday you’re supposed to buy new clothes for the children, have a big feast. But of course, no one could follow those traditions anymore. It was a sad story. The situation in the camps was very sad. Some people were hopeful they would be able to go home, but only, “After Bashir,” they said. They told me only after Bashir goes to the ICC will we be able to go home. Some of them were even born in the camp, and they don’t even know their home. Do you ever see yourself living in Darfur again? Me? Yes, yes, I will. I have to go home one day. At any time that this Bashir government leaves I will go back, because I want to do projects to help my community there. Projects for women and kids, development projects, radio programs about avoiding tribalism… There is so much to do there.